LISTEN NOW! Greg, John, and Pat discuss the temple mount in Jerusalem and the strategy of blame that has been waged against Israelis. They continue to discuss the battle that has taken place over time regarding the temple mount in Jerusalem by Muslims and Jews. 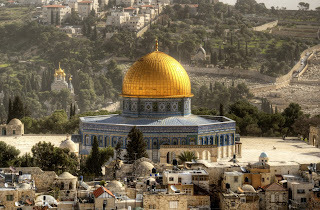 The dome of the rock is a Muslim mosque that has been built on top of where both temples were built. This is the most holy and controversial piece of real estate in the world. CBN reports that when Muslims want to unify the people say Al-Aqsa Mosque is in danger. This is a tactic that is used against the Jews to incite Muslims to anger and unity. Blame the Jews for everything and if any bad things happen don’t take responsibility and look inward, no blame the Jews.